I'm one week post op and I can feel it. I'm grateful for those people who dropped of meals last week. It was so so helpful. My recovery is 6 weeks so I need to make sure I don't overdue it. Today I'm still not feeling great and don't know if there are any more meals on the way so I need to make sure I do my menu plan so I can remember what I need to take out of the freezer each day. So my menu plan will be lack luster with no fun new things to try. But plan I will. Breakfast will be oatmeal or toast or eggs. Lunch's will be frozen pizza from the freezer, frozen pizza rolls, tuna, popcorn, cheese and crackers. I'm expecting to be feeling better next week, but I still need to take it slow. 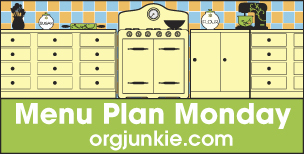 As always, be sure to check out The Organizing Junkie every Monday for more menu planning ideas and help. I don't think your menu sounds lackluster at all! It all looks great. And how good is must feel to have meals already prepared in the freezer. Hope your recovery goes smoothly!